Manchester United are ‘increasingly confident’ of sealing a deal to sign Arsenal forward Alexis Sanchez, after Gunners boss Arsene Wenger confirmed the future of his star man will be resolved imminently. Wenger left Sanchez out of his team for Sunday’s game at Bournemouth, with the 2-1 defeat a hammer blow to his side’s hope of pushing for a top four finish in the Premier League. He then confirmed that Sanchez was left out of the trip to the Liberty Stadium as he was on the brink of finalising a move, with Manchester City also in the mix to sign the player who will be out of contract next summer. “It could happen today or tomorrow or not at all,” Wenger said, when asked about Sanchez leaving. “That’s why I didn’t want to travel with him today for him to go somewhere else. “Alexis would have played but this is a difficult period for him. He has always been committed until now. 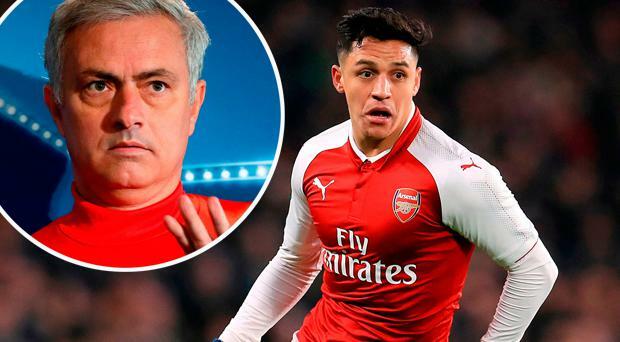 Now reports are emerging suggesting United have agreed to pay Arsenal £35m to sign Sanchez, with their lavish wages offer and eagerness to pay a huge fee to the player’s agent believed to be close to securing them the signature of the 29-year-old. City are believed to have been reluctant to spend more than £20m to sign Sanchez now, as they were confident of landing the player on a free transfer next summer. Yet United’s huge cash offer and may be enough to swing the deal their way, with Arsenal believed to be close to signing Brazilian forward Malcom from Bordeaux as his replacement, while Borrusia Dortmund's Pierre-Emerick Aubameyang is also reported to be close to agreeing a £53m move to Arsenal. “If Sanchez goes we need to replace him,” added Wenger. “Today we missed many players in our squad. You see that they have a weight in the team. “If players like Sanchez go we of course have to respond to it. Will he go or not? I don’t know, but at the moment it’s transfer period. In this period you use the players who are completely focused on being at the club. City could still make a late move to scupper United's efforts to sign Sanchez, but it appears the biggest spending team in the Premier League are in danger of being outbid by their local rivals for a player they have chased for more than a year.